Once you’ve perfected basic techniques like frying an egg and cooking rice, it’s time to move on to those things that may have initially scared you off. Every other Monday, we’ll be going beyond the basics to help you tackle even the scariest cooking techniques. 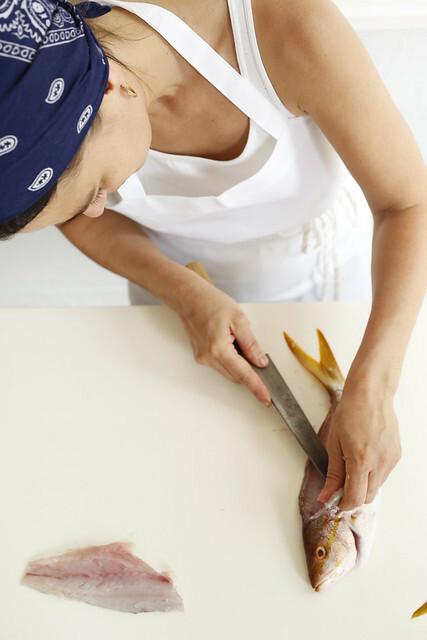 Today: Camille Becerra teaches us to fillet a whole fish. Just remember: practice makes perfect. When buying fish — especially for crudos, ceviches, or other raw fish dishes — I always find it best to buy whole fish. I like to think it’s been more protected from bacteria. 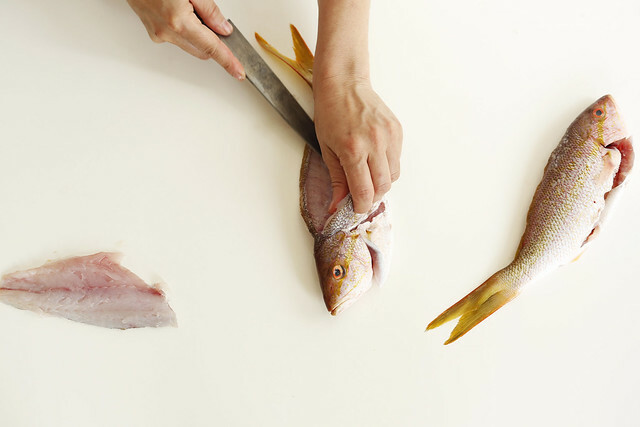 Most fish have been gutted, but certainly always check; that’s one messy process you don’t want to have to do a home. I also prefer to have it scaled, even if I’m not planning on eating the skin. Scales have a tendency to slip into the final product when still attached to the skin. And nobody wants that. 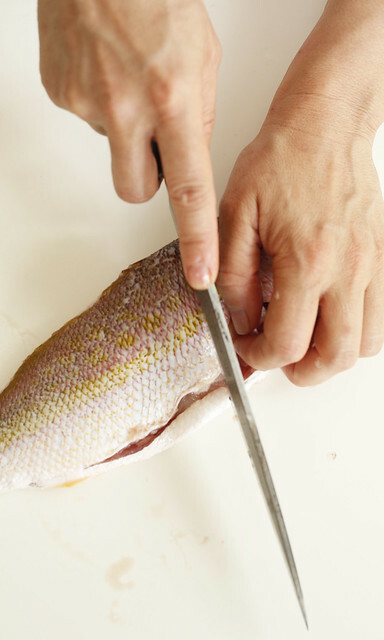 More: After you’re done filleting your fish, learn all about ceviche. If you’re new to this technique, it’s important to take your time with it; it’s a technique based mainly on feel. Keep in mind that fish needs to be kept cool; put your fish on ice or in the refrigerator immediately after you’ve broken it down. First: using a sharp knife, make one incision near the head under the pectoral fin and one near its tail fin. Do this on both sides of the fish. 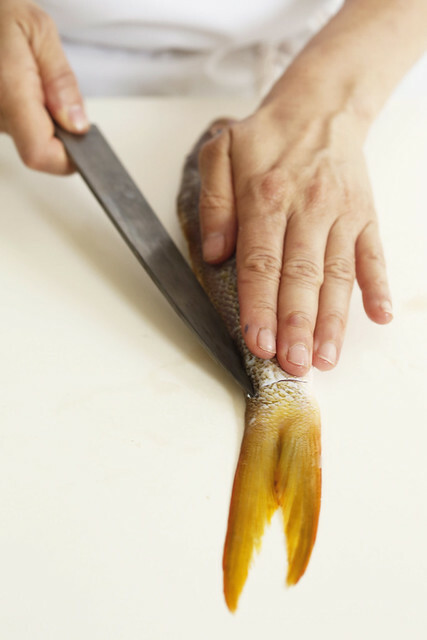 Make another incision on the top of the fish coming as close to the dorsal fin as possible and down the entire length of the fish to the tail. The dorsal fin is the top fin that runs the length of the fish. All three incisions should meet. Start cutting through the body using the bones to guide your knife. Lean your knife gently on the bones and make small swipes. With each swipe, pick up the fillet, look to see you are coming as close to the bones as possible and continue. The bones are your guide, so it is important that you have a feel for them. When you’ve reached the middle you’ll need to point the knife every so slightly upward to move past the vertebral column, the main bone that all the smaller ones attach to. The whole length of the knife will angle upwards a bit to pass the spinal bone; the knife should rest on the bone as a guide. Once you’re past that, continue the swiping motion with the knife pointed a bit downward until you reach the bottom end. 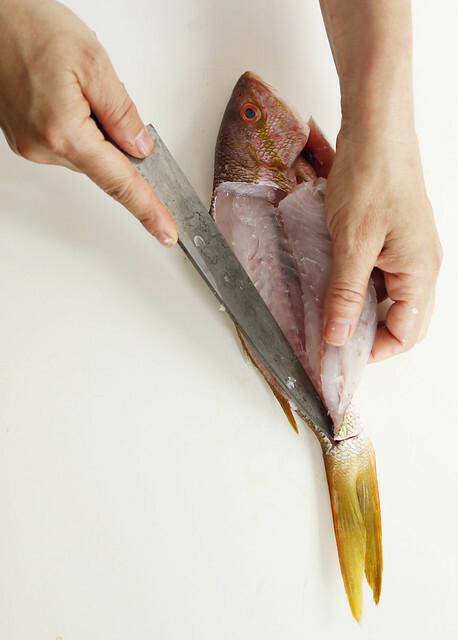 Once the knife reaches the bottom, you will find the fillet is held by the skin on the bottom belly area. 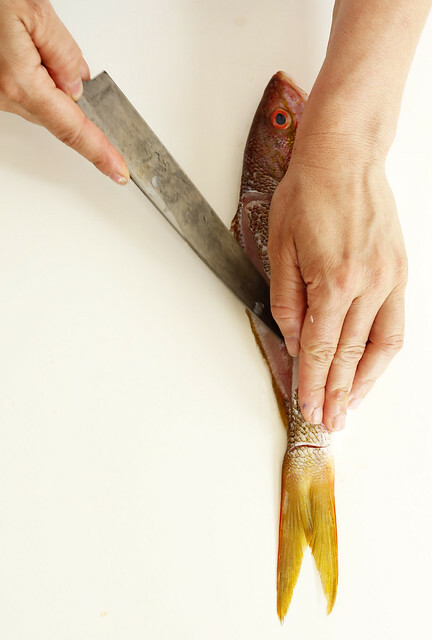 Then, you can simply make a clean cut to separate the fillet from the body. Feel the fillets for any stray bones that might have been left behind; a tweezer works well at pulling them out. And remember: practice makes perfect.